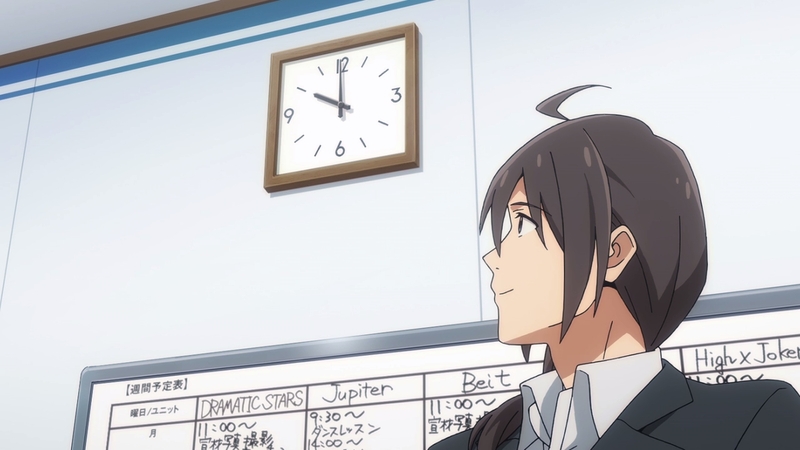 While our weekly coverage of anime tends to focus on the effect of production circumstances over the creators rather than the behind the scenes information by itself, sometimes the actual production matters take precedence. Sometimes there’s extreme events, while others are more personal curiosities; the one I’m about to address comes under the latter. Two things immediately stand out in this week’s credits, starting with the number of animation directors credited. The general rule of thumb is that having so many this early on indicates a struggling production, though allow me to be blunt and admit that I couldn’t care less about this at the moment despite its possible repercussions down the line. Instead, it’s Noriko Takao working as storyboard artist under the alias of Mitsuru Nakashima that has my full attention. 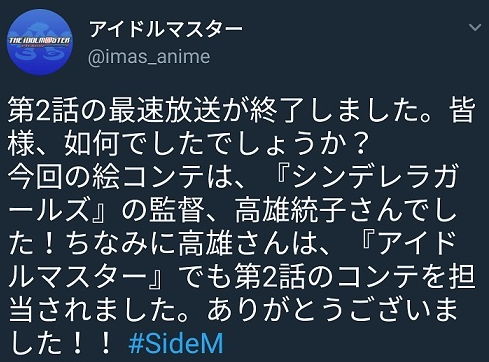 Working under an alias (or simply remaining uncredited in the case of key animation work) is actually rather common in the industry, but for Takao to do so on an imas project of all things raises a number of questions, especially so when the official Twitter account that revealed it quickly deleted their tweet afterwards. Her last appearance before this was on Occultic;Nine, which lead to speculation that she may be involved in DARLING in the FRANKXX alongside the rest of the team who moved there following it, but said speculation might have been shot down with this turn of events. Aliases may be common, but there’s no logical reason for her to use one here when both projects are not only under A-1, but spearheaded by the same animation producer to boot. If anything, it might be a sign that she’s currently working on a project at a different studio entirely, which is notable in and of itself considering she’s worked exclusively at A-1 ever since her departure from KyoAni. While I can’t say much for sure here without access to behind the scenes information, I can say that it has absolutely nothing to do with Takao trying to hide her name or some other garbage that certain fans have been trying to fool themselves and others into believing. This isn’t even something worth touching on here under normal circumstances, but I’ll come clean and admit that seeing people who didn’t like Cinderella Girls take some perverse joy in the idea of her career seemingly being in peril if she has to use an alias has touched a nerve. Nastiness aside, the real irony is they come from people who preach about how much better Animas was while somehow missing the reality that she played a key part in how that turned out in the first place. Atsushi Nishigori may have been at the helm, but Takao was always involved with key decisions in regards to its direction, particularly when it came to Chihaya and Haruka’s story arcs – Nishigori even had her handle their respective episodes herself due to the delicate and thorough touch that he lacked. 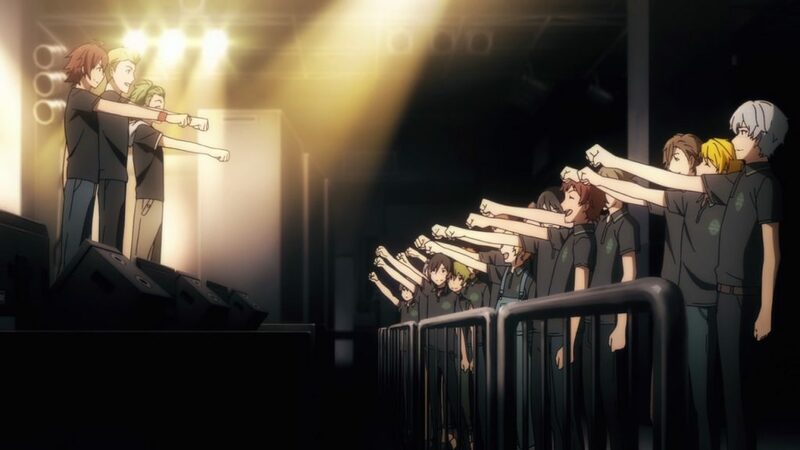 There’s no harm in voicing one’s discontent; let’s not forget how vocal I myself was about a chunk of Cinderella Girls’ first half, but hurling unwarranted abuse at a creator and taking advantage of situations like this in some miserable attempt to damage their image is not on, plain and simple. Fortunately these attempts won’t ever amount to anything, as Takao’s simply too good for them to matter. She’s here to stay, regardless of the people who want to throw tantrums about it. With that out of the way, we can finally take a look at the episode itself. Which was great! 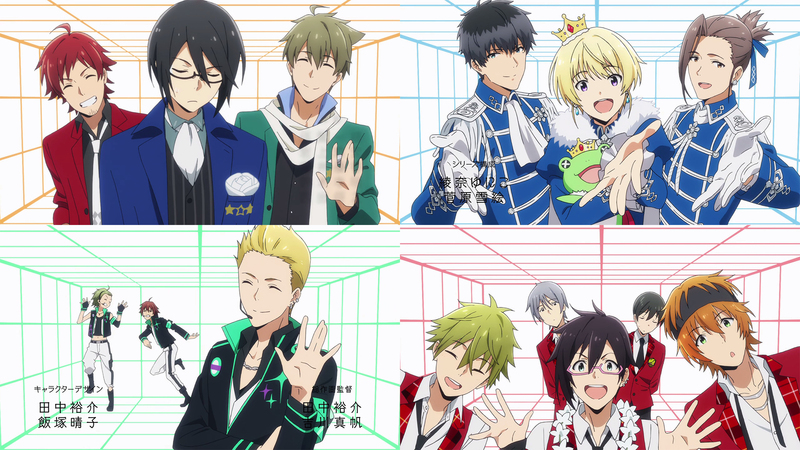 Both the overall tone and events are reminiscent of Animas’ second episode – also handled by Takao! – but what I most appreciated was the succinct introduction of danketsu, the concept that encapsulates unity between the idols in this franchise. 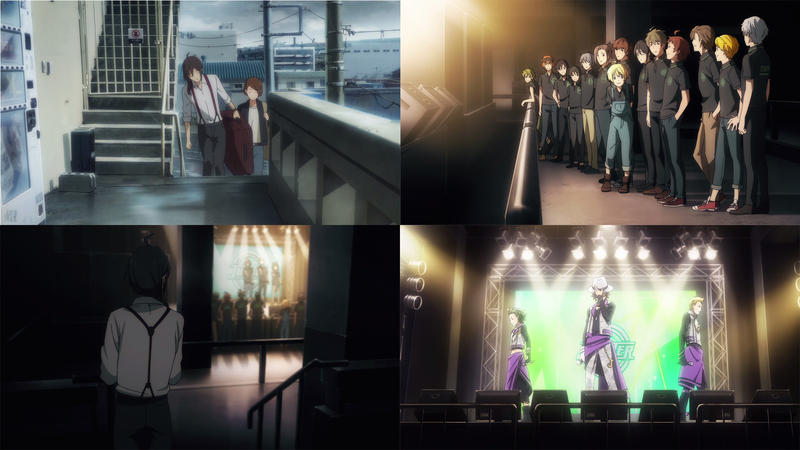 You can trace this idea back to the early days of imas, when it received its own song and official music video. As time has passed, it’s become something that defines the franchise as a whole. Animas had no need to introduce it formally by nature of 765Pro being the living examples of it, setting out instead to explore the importance and difficulty of maintaining it. Meanwhile, in Cinderella Girls we see Minami teach the rest of the Cinderella Project girls about it towards the end of its first half. 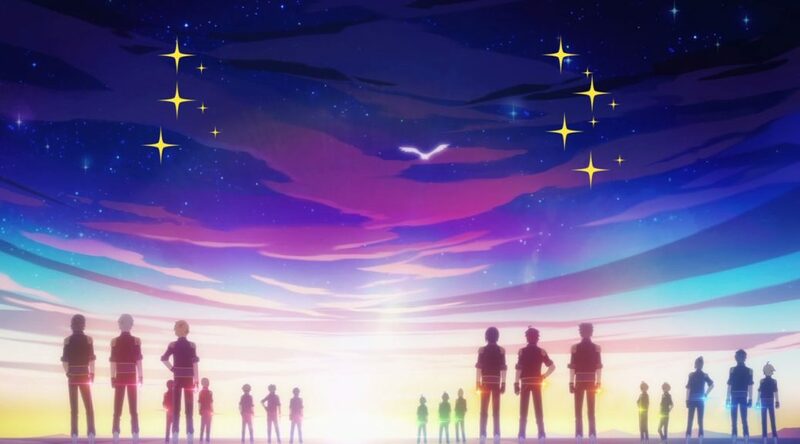 SideM takes a similar route to the latter, though it’s something the 315Pro members discover together as they help prepare Jupiter’s stage in place of the missing staff members. Their friendship and rivalry with one another has been established. All that’s left now is to see where it takes them. Outside of this it’s a rather light episode when it comes to directional and thematic highlights, though there are little details that make it fun to pay attention to nonetheless. 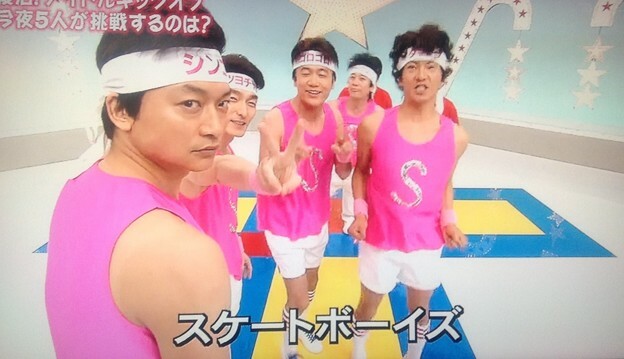 Subtle character moments like Kaoru shyly raising his hand amongst all the enthusiastic responses to seeing Jupiter’s performance, the cheeky reference to SMAP’s Skateboys past with S.E.M’s choice of outfit for their photo, and even the broken clock being fixed at the end of the episode. 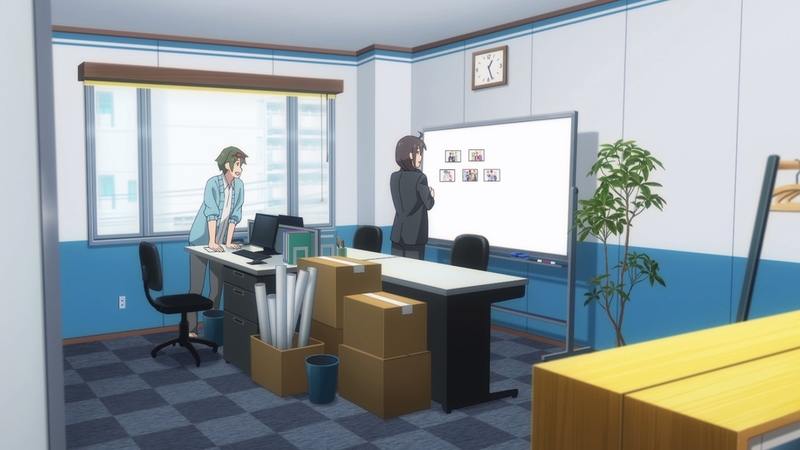 Takao’s work gets to shine most during the stage preparations mentioned earlier, as the layouts do a convincing job of creating environments with volume, no doubt a product of her detailed storyboards. I’d love to see her appear again later on for perhaps a heavier episode, but chances are that won’t happen, all things considered. Great to see her have the opportunity to join SideM at least once though, especially after it’s been so long since her last appearance! The episode itself may have been somewhat low on highlights, but this is where we turn our eyes back to its credits. 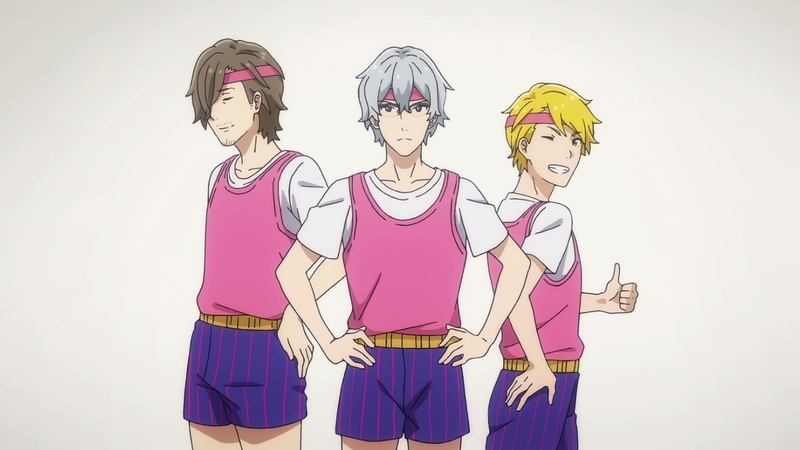 A quick glance at the list of key animators brings with it the shock of Asako Nishida‘s participation, while a thorough one reveals that a number of interesting youngsters have made their way onto the show as well. Nishida’s name obviously stands out most though, and for good reason; I’d be doing a disservice to her long and influential career if I tried to sum it up in a few sentences here, but the character designer for this season’s Land of the Lustrous finally making her way into the credits for an imas adaptation feels long overdue considering she’s been less than reserved about her affection for the franchise. It’s especially interesting that fate just so has it that this would happen while Love Live Sunshine is airing at the same time, considering she was a central figure in Love Live from its conception until her departure after season two of the original TV series – perhaps the most overt sign that she truly has moved on from it. Shiori Mizutani might just be something akin to the yin to Nishida’s yang at the moment: an industry veteran working in tandem with a youngster who isn’t even part of the industry yet. While she’s put out a number of indie works thus far, she’s still an animation student at the moment who’s on course to make her way into the industry next year, so her appearance here is a rather exceptional case, as she had only collaborated a couple of times with studio DEEN before as far as professional work is concerned. It’s particularly heartwarming considering she’s a big SideM fan, too! The show might have lost a number of veterans to the series, but it’s going to turn out to be a very interesting production if more and more youngsters like her and Dogakobo-affiliated Hayate Nakamura keep turning up. I love it. Reason is a great song and Kuroki has taken care to construct the sequence around it well through incorporating both series traditions and new ideas. Seeing familiar names like Isao Hayashi, Toshifumi Akai and Kazutaka Sugiyama is nice, while Kenji Sawada takes the top credit for his contribution to the dancing sequence. Nishida makes another appearance with her lovely work on Teru scooping up the star and holding it high, though my favourite part may well be him taking his step into the water. If there’s one way to make the viewer feel like they’re watching imas, it’s through an OP like this. Job well done! 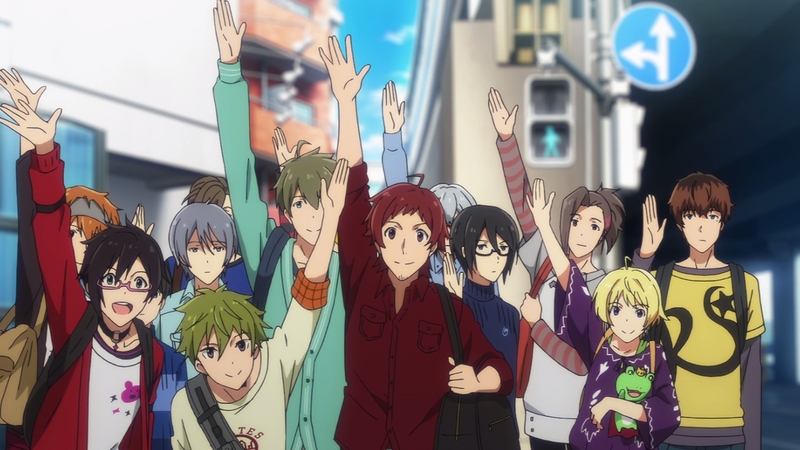 What were your problems with the first half of Cinderella Girls? The general contrast between Takao’s own episodes and the rest made many of them feel like they were from a different show, and a good chunk of the characters never amounted to more than their gimmick at that point. Episode 8 surprised me a lot because I expected Ranko to be treated like a certain annoying character in a show airing this season, only for her condition to be treated with delicacy. What episodes did Takao do? She did some work on 14 and 25, but 24’s the one she focused on most since by that point she was much busier both keeping the production afloat and ensuring that the rest of the episodes were in line with her vision for it.